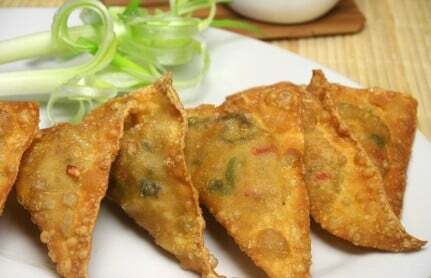 Home » Appetizers » Samosa – You can make Indian appetizers at home, these are spicy filled fried dumplings. Samosa – You can make Indian appetizers at home, these are spicy filled fried dumplings. This is a quick and easy Indian snack. I love these when I go to an Indian restaurant, they are like deep-fried dumplings. Thanks to ultimatum chef for sharing this recipe. You can make Indian appetizers at home, these are spicy filled fried dumplings. How to make samosa: For Cover: Mix all the ingredients (salt, oil, ajwain) except water. Add a little water at a time. Pat and knead well for several times into a soft pliable dough. Cover it with moist Muslin cloth and keep aside for 15 minutes. For Stuffing : In a bowl add mashed potatoes and all dry masalas (salt, chili powder, mango powder, garam masala) and green chilles, ginger and Mix well. Add green peas, cashews and raisins and mix well. Add coriander and keep aside. To Proceed : Make small rolls of dough and roll it into a 4"-5" diameter circle. Cut it into two parts like semi-circle. Now take one semi circle and fold it like a cone. Use water while doing so. Place a spoon of filling in the cone and seal the third side using a drop of water. Heat oil in a kadhai and deep fry till golden brown (fry on a medium flame). Years ago, my neighbor brought some over, I never had these before, and now I can’t get enough. It’s one of my favorite recipes! !